A withdrawn “Tipsy” design in white gold, adorned with diamonds and blue sapphires. A perfect timeless, one of a kind gift to be passed down through generations, gaining meaning and value through time, a real family treasure, a priceless heirloom, a new ancient jewel. A sublime pair of handcrafted wedding rings, made to order by a lovely couple that were not scared to express their wishes. And this is what we came up with. 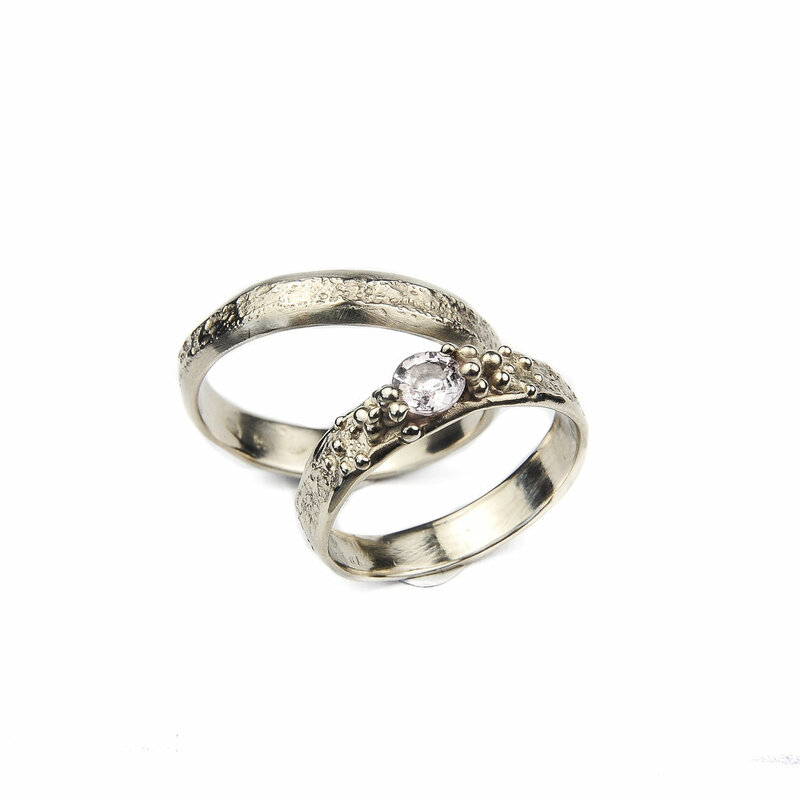 Concealed at first glare but rich in detail up close, bride's ring additionally embellished with a light pink sapphire. Bride's ring enlaces sapphires and a diamond in a white gold threaded band. The shapes are intentionally uneven and flow around the finger freely and organically. Working on these pieces, was a treat, since I am severely in love with irregular designs, as are the soon to be wed clients. 14K white gold fuzzy ring with pink-grey tourmaline and diamonds. A magnificent, massive blue turmaline was entrusted to me to be dipped in a distinctive golden lace to boast with its deep inner beauty. A grandiose piece carefully made for an amazing woman with a particularly sublime taste for jewels. What an honour this was! 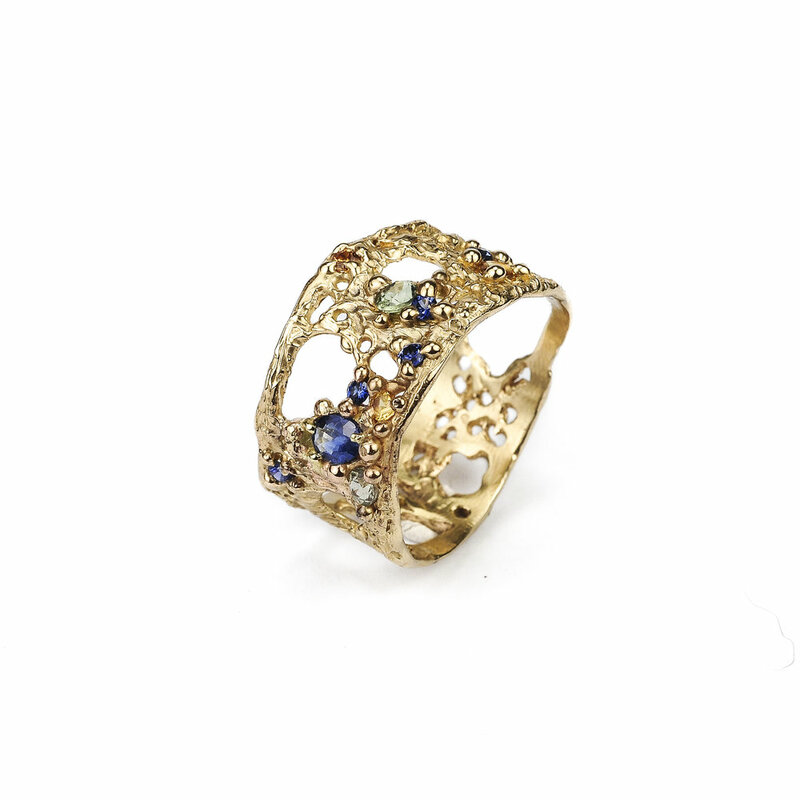 A big, bold 14K yellow gold treasure ring in bustling colours, made for someone who knows the importance of jewels in one's life. A big juicy ruby dominates the center of the rich setting, surrounded by glistening sapphires and translucent tourmalines. The setting is a cluster of unique raw textures, high quality stones (topaz, aquamarine, tanzanite, peridot, morganite) on a wide band, radiating edginess and femininity at the same time. A fairytale ring brought to existence. A new ancient, to be passed down through generations. 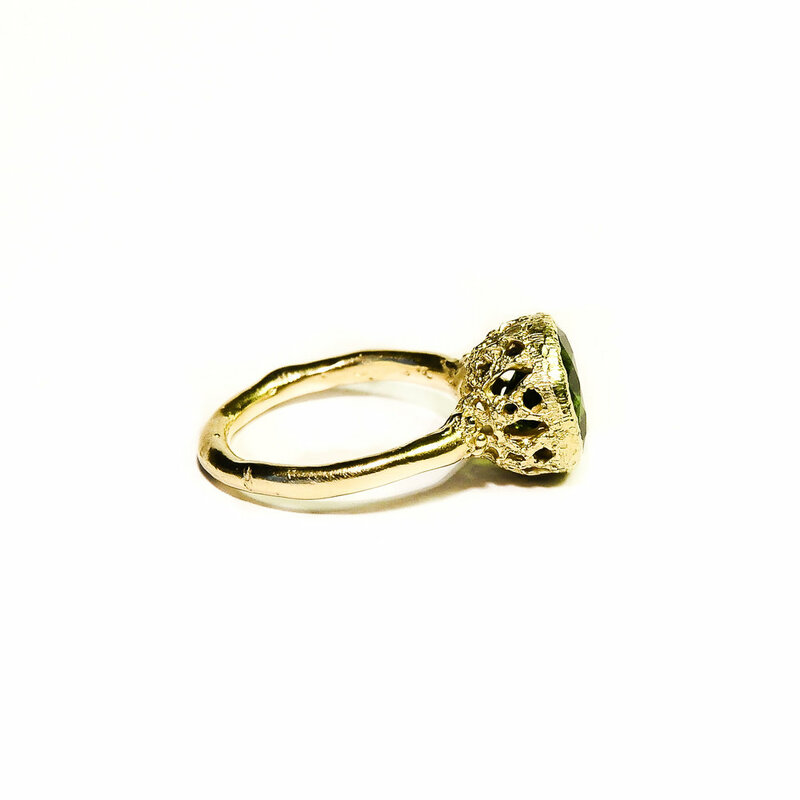 Big, organic and sophisticated ring which allows light beautifully seep through due to translucency of the stone that is meticulously surrounded by a golden lace body. Extremely elegant, lustrous and hip, comfortable to wear every day. 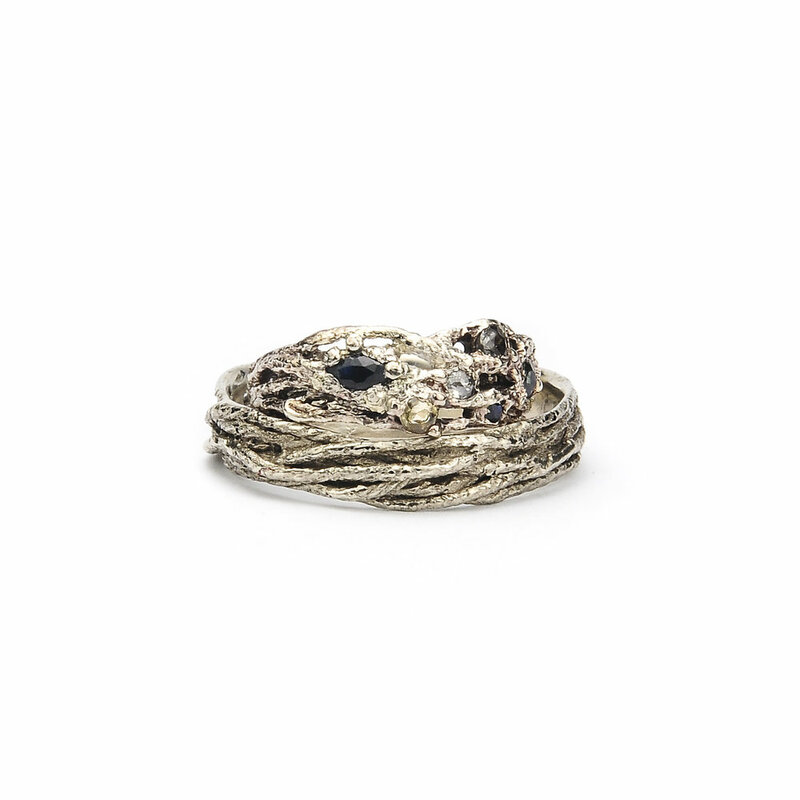 Ancient mood with a modern twist, a fairytale ring brought to existence.